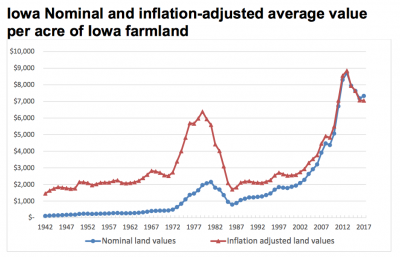 The 2017 Iowa State University Land Value Survey was released on Tuesday, and showed that farmland values climbed 2% this year. The survey was conducted in November by the Center for Agricultural and Rural Development at Iowa State University and Iowa State University Extension and Outreach. Highlights of the survey are discussed in today’s update, along with recent news articles that explored the state of the Corn Belt agricultural economy in greater detail. 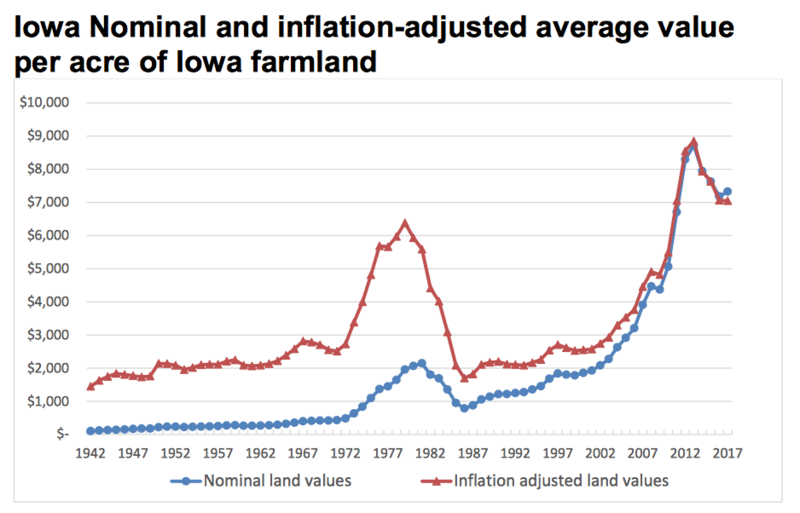 Donnelle Eller reported on Tuesday at The Des Moines Register Online that, “Iowa farmland values climbed 2 percent to $7,326 an acre this year, the first increase after three years of decline, an Iowa State University survey Tuesday showed. “The improved results fail to signal a change in the land market, though, said Wendong Zhang, an ISU economics professor. 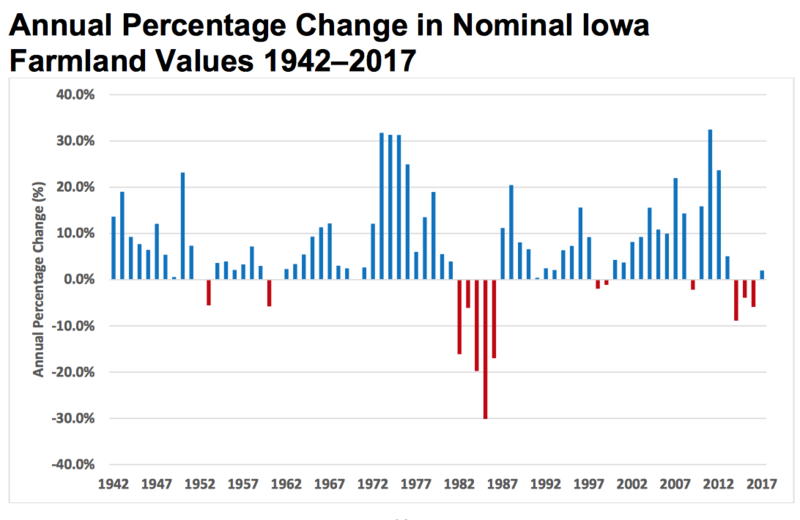 “Beginning in 2004, the ethanol boom, historically low interest rates and other factors pushed five consecutive years of double-digit growth in average farmland values that hit a historic peak of $8,716 an acre in 2013. 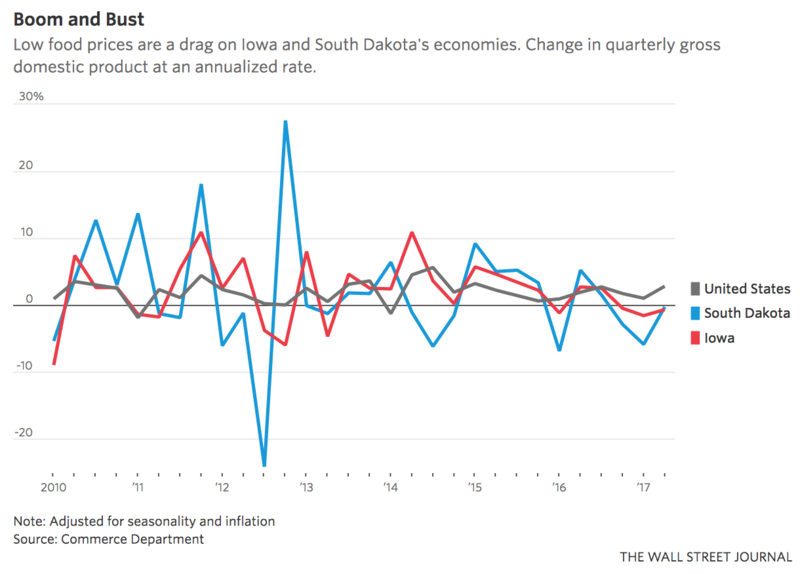 Meanwhile, a pair of articles in Sunday’s Omaha World-Herald explored the state of the Corn Belt economy in more detail. “At a Crossroads,” articles by Barbara Soderlin and Cole Epley on the front page of the Money section in Sunday’s Omaha World-Herald explored current issues in the Corn Belt agricultural economy. 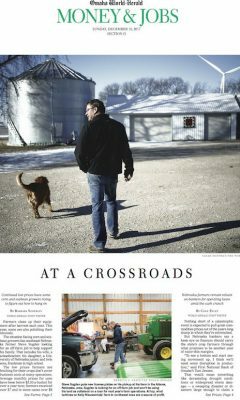 Barbara Soderlin reported that, “The situation facing corn and soybean growers has southeast Nebraska farmer Steve Sugden looking for an off-farm job to help support his family. That includes his wife, a schoolteacher; his daughter, a University of Nebraska junior; and twin sons, freshmen in high school. 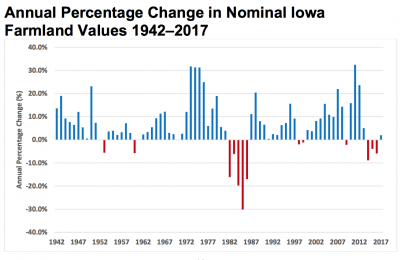 The article added that, “And next year, belt-tightening is likely to continue, as economists’ forecasts call for no meaningful increases in crop prices. Cole Epley reported in Sunday’s Omaha World-Herald that, “Nothing short of a catastrophic event is expected to pull grain commodities prices out of the years-long slump in which they’re entrenched. Mr. Epley explained that, “Assurances around U.S. foreign trade policy are lacking, and that has some bankers convinced that prices could go even lower. ‘Export sales are an important part in price stability, so being able to maintain our markets as trade agreements potentially fall away could be hard and have a bad impact on prices,’ said Daryl Wilton, executive vice president and chief credit officer at Cornerstone Bank in York. Also, Sharon Nunn and Benjamin Parkin reported earlier this month at The Wall Street Journal Online that, “Farmers are producing too much food, holding down prices and holding back economies in states with big agricultural industries. “Low Food Prices Are Hurting Farm-State Economies,” by Sharon Nunn and Benjamin Parkin. The Wall Street Journal Online (December 6, 2017).